Coach Natalie Hathaway couldn’t be happier about her cheer team traveling to Charleston for the West Virginia Class AA cheer competition. It’s been four years since Bridgeport has had a shot at the state title. In 2014 and 2013, the Tribe finished runner-up to RoC. Byrd. RCB - which finished runner-up to BHS at the Nov. 3 Class AA, Region II championships - is among competitors at this year’s states to be held Saturday at the Charleston Civic Center. The entire field of competitors includes – in order of performance – Logan, Westside, Man, Weir, Winfield, Bridgeport, Keyser and RCB. Lincoln County has been added to the field of competitors after appealing a regional loss due to a timing issue. 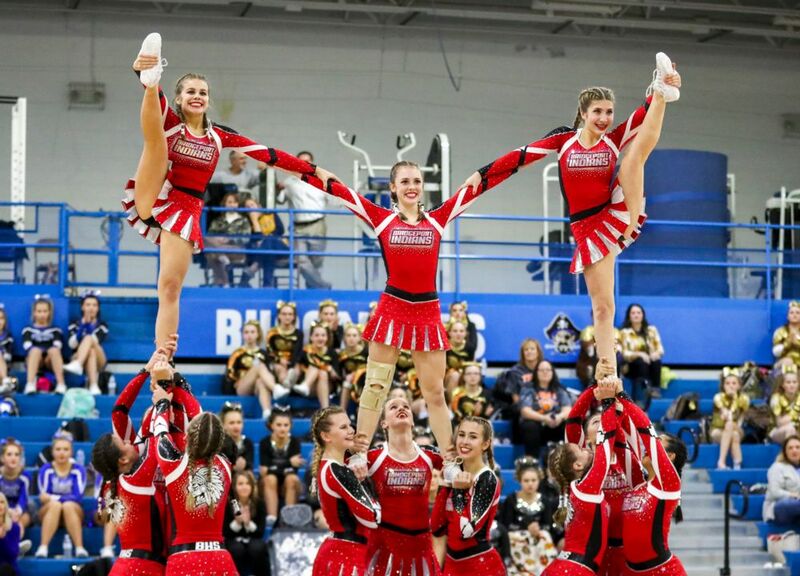 Since capturing the regional title – and Nov. 7 Big 10 title at Buckhannon-Upshur High School - members of the BHS cheer team have been hard at work, perfecting the technical cheer and dance routine, tweaking jumps, tumbling, stunting, synchronization and transitions. Since the team’s success in November, the girls wanted to raise the bar, adding difficulty to the routine and to their individual tumbling. The work has been put in and the girls have their eyes on the prize, but also the experience of a performance at the state championships. “I’m excited for them to have that experience and have fun,” Hathaway said. The squad will give the community a sneak peek Thursday evening at a fan night performance to be held 6:30 p.m. at the BHS gymnasium. Doors will open at 6:15 p.m.
Members of the Indian cheer team are seniors Isabelle Cunanan, Lexi Galan, Sophie DelGreco and Ashley Weber; juniors Miranda Kress, Lindsey Suter, Sophia Gorby, Addison Boggs and Alyson Gibson and freshmen Lilly Strait, Gyllian Wagner, Emilia Underwood, Lauran Johnston, Rylee Mullins, Amelia Duarte, Jade Nguyen and Lillian Iaquinta. Class AA competition begins at noon. Preceding Class AA will be Class A competition, beginning at 10 a.m. In order of performance, teams are Williamstown, Fayetteville, Midland Trail, Madonna, Tug Valley, Clay Battelle, Wheeling Central and Notre Dame. Following Class AA will be Class AAA competition at 2 p.m. Teams in order of performance are Spring Valley, Woodrow Wilson, George Washington, Brooke, Hurricane, Martinsburg, Wheeling Park and Jefferson.